From humble origins, Jo Ann Davis emerged as a successful businesswoman, state delegate, and U.S. Representative. Just four years after winning her first political office in the Virginia general assembly, Davis won election in an eastern Virginia district along the west shore of the Chesapeake Bay as the first Republican woman to represent her state in Congress. 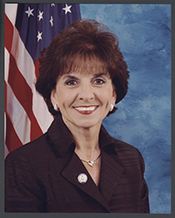 With seats on the Armed Services, International Relations, and Intelligence committees, where she served as chairman of the Intelligence Subcommittee on Terrorism, Human Intelligence, Analysis and Counter–Intelligence, Davis positioned herself as a strong advocate for the defense–related interests which dominated her district. Jo Ann Davis was born in Rowan, North Carolina, on June 29, 1950. When she was nine years old, her family moved to Hampton, Virginia. Her upbringing—she recalls spending much of her childhood living in a trailer park—was modest. In 1968, she graduated from Kecoughtan High School in Hampton and later attended the Hampton Roads Business College. Afterwards she became an executive secretary at a Newport News real estate company.1 She married Chuck Davis and they raised two children, Charlie and Chris, in Hampton Roads, Virginia. Jo Ann Davis earned a real estate license in 1984 and opened a property management company in 1988. She then established her own realty business in 1990. In 1997, one of her employees pulled her aside and said, “Jo Ann, come here. Have you ever thought about running for public office?” Davis replied that was a “crazy” idea.2 She soon changed her mind, however, and ran a successful campaign that unseated a well–financed incumbent state delegate in 1996. She was re–elected with more than 70 percent of the vote. Davis served in the Virginia house of delegates from 1997 to 2001. In the 107th Congress (2001–2003), Davis landed assignments on three committees: Armed Services, Government Reform, and International Relations (later named Foreign Relations). In 2004 she left her Government Reform post, where she had risen to chair the Civil Service and Agency Reform Subcommittee, to join the Permanent Select Committee on Intelligence, where she served two terms. From her post on the Armed Services Committee, Davis was attuned to the needs of her district, with naval and air force installations in the Hampton Roads area, the Quantico Marine Corps Base, and a group of smaller military and NASA installations scattered throughout the region. Once in office, she became a leading proponent for expanding the Navy fleet by nearly 60 ships, to 375. She supported a pay raise for military personnel and backed a veterans’ benefits bill, the Veterans Opportunities Act of 2001. Davis introduced her own legislation, the Servicemembers’ Group Life Insurance Adjustment Act, which sought to retroactively raise the family benefits for dependents of servicemen and servicewomen killed in the line of duty. The legislation passed the House in March 2002 and was signed into law several months later. She also led an effort to increase funding for a major overhaul of the aircraft carrier Dwight D. Eisenhower at the Newport News ship facilities. Davis developed an environmental record that won praise from both Democrats and Republicans. She was able to secure $48 million in federal funding to clean up and remove a portion of the “ghost fleet” of dilapidated decommissioned naval ships from a site on the James River near Newport News. Another one of Davis’s environmental projects involved her longtime opposition to the growing trash importation industry in Virginia. She also opposed the construction of a Newport News water reservoir that would have flooded hundreds of acres of wetlands.4 On the contentious issue of developing oil reserves in Alaska’s north range, Davis voted with her party to allow exploratory drilling. Davis passed away on October 6, 2007, in Gloucester County, Virginia, after a two–year–long battle with breast cancer. She was succeeded in a special election on December 11, 2007, by Robert J. Whitman, a former member of the Virginia house of delegates. 1Politics in America, 2004 (Washington, D.C.: Congressional Quarterly Inc., 2003): 1039. 2Hugh Lessig, “Can Davis Make Her Mark in Politics?” 15 October 2000, Norfolk Daily Press: C1. 3“Election Statistics, 1920 to Present,” http://clerk.house.gov/member_info/electionInfo/index.aspx. 4Michelle Boorstein, “Entrenched Incumbent Faces Foe of Big Government,” 10 October 2004, Washington Post: C5. 5“Jo Ann Davis,” 28 October 2004, Washington Post: Virginia Extra Section, T6. 6“Election Statistics, 1920 to Present,” http://clerk.house.gov/member_info/electionInfo/index.aspx. Papers: 2000-2007, 4 boxes. The papers of Rep. Jo Ann Davis are mostly legislative material where she was either an originator of or co-signer to "Dear Colleague" letters or as a sponsor or co-sponsor to legislation. The papers also include correspondence, speeches, press releases and office files. "Jo Ann Davis" in Women in Congress, 1917-2006. Prepared under the direction of the Committee on House Administration by the Office of History & Preservation, U. S. House of Representatives. Washington: Government Printing Office, 2006.